As I mentioned in my review of Gray Lensman, Book 4 of E.E. “Doc” Smith’s famed six-part LENSMAN series, that installment, although it followed its predecessor, Galactic Patrol, by mere seconds storywise, was actually released over 1½ years later; 20 months later, to be exact. Book 5 of the series, Second Stage Lensman, would follow the same scheme. Although the events therein transpire just moments after the culmination of Book 4, readers would in actuality have to wait a solid 22 months to find out where author Smith would take them next. Book 5, like its predecessors, initially appeared in the pages of the legendary pulp magazine Astounding; in this case, as a four-part serial in the November ’41 – February ’42 issues, as America entered WW2. As had been the case with Gray Lensman, the first two installments copped the front cover illustration, again by famed artist Hubert Rogers. 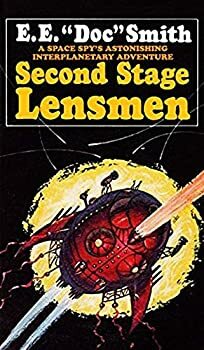 Second Stage Lensman saw its first book release as a $3 hardcover from Fantasy Press in 1953, with another wonderful cover by Ric Binkley, and has seen numerous incarnations since; this reader was fortunate enough to get hold of the 1982 Berkley edition, with still another beautiful cover by David B. Maddingly. 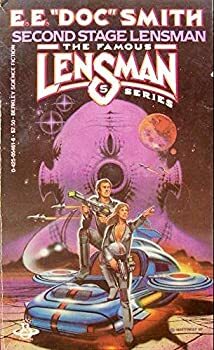 Book 5 continues the adventures of Galactic Patrolman and Unattached (i.e., under no outside authority) Lensman Kim Kinnison as he and his fellows strive to eradicate the Boskonian threat emanating from a neighboring galaxy. The book ups the ante considerably, brings back many old characters while introducing new ones (including new villains and evil races), incorporates new weapons of superscience, and wows the reader with some of the truly colossal space battles that seem to have become de rigeur at this point. As I mentioned, the story line here picks up almost precisely where Book 4 left off — with Kim and his beloved nurse/fiancée Clarrissa MacDougall running off to get married — but not before “historian” Smith gives his readers a concise synopsis of what had transpired earlier; a summary requiring a full 14 pages, the plot having become so involved by this point! And then, we’re off, as Kim receives a mental warning from the multibrained being known as Mentor, from Arisia … the planet that had benevolently provided the suitable recipients of this galaxy with the Lens, and whose 2 billion-year conflict with the evil entities from Eddore constitutes the overarching backdrop of this series. Mentor warns Kim that his work is not yet finished, despite the destruction of the Eich in Book 4, and counsels Kim to “THINK.” A little cogitation on Kim’s part makes him realize that his wedding plans may indeed be a bit premature, and that an alien invasion from that other galaxy, most likely via the Boskonians’ hyperspatial tube, is very probably imminent. And indeed, after a short period of waiting, that attack does indeed come, resulting in a very narrow victory for our Civilization, in a battle sequence that might have been a fitting climax for most other books (but that here occurs within Second Stage Lensman’s first 30 pages!). Following this victory, Kinnison follows a suspected zwilnik (i.e., a person involved in the Boskonian drug business) to the distant world of Lyrane II, located in Rift 94 of Dunstan’s Region, one of the spiral arms near our galactic rim. The world’s only populace, as it turns out, is a male-detesting, naked-going matriarchy, equipped with not inconsiderable mental abilities of their own. But Kim and his 2,100 crewmembers of the Dauntless manage to leave safely with their zwilnik, a young woman named Illona, who becomes enamored with Civilization’s mores and allows Kinnison to probe her brainwashed mind for clues. With some invaluable assistance from Nadreck the Palainian (a bizarre race that had been introduced to us in Book 2, First Lensman), Illona’s home planet, Lonabar, is tracked down, and Kinnison goes undercover there as a jewelry dealer and fence named Cartiff, in an attempt to wrest information from the planet’s headman, Menjo Bleeko. Interestingly, our two main characters here, Kim and Clarrissa, the two penultimates in the Arisians’ millennia-long breeding program, undergo some subtle changes in this installment. Kinnison is noticeably tougher and more hard-boiled; more ruthless and less like the “good little Boy Scout at heart,” as he describes himself to the Lyranian headwoman. Indeed, his manner of speaking to those murderous Lyranians is actually like something out of a 1940s film noir drama, and he ultimately comes to realize that Nadreck’s cold-blooded efficiency (“cold-blooded” in both senses of the word, as the Palainian hails from a frozen ice planet) is indeed the way to best accomplish his tasks. As for Clarrissa, she is here made an official Lensman, the first female in our galaxy to be given that honor, and is nicknamed the “Red Lensman,” in acknowledgment of her flaming hair color. (On a side note, this reader could not stop picturing the early 1940s Maureen O’Hara as the perfect actress to portray MacDougall. I don’t know which actress today would — to use Galactic Patrol parlance — “have the jets to swing it.”) The character of Mentor, too, is subtly changed here, coming to Kim’s long-distance aid on at least three occasions, rather than just giving answers to tough questions. As mentioned, this Book 5 introduces some new weapons of superscience, as it seems every time the Boskonians or the Galactic Patrol comes up with something unbeatable, it is either copied by the opposing side or countered with some neutralizing gizmo shortly after. Thus, in this installment, the Patrol has as its newest offensive weapon the “sunbeam,” which drains the power of a nearby star when shooting off its irresistible rays of destruction. And Kim himself has a new weapon at his disposal, as if his Lens were not enough; a miniature device invented by Worsel the Velantian that enables Kim to make unstable the complex brain molecules involved in thought, spelling instant death for his victim! As for those battles alluded to up top, this installment gives the reader some doozies, including the Boskonians’ attack on Earth; the battles with the Boskonians both above Lyrane and involving hand-to-hand combat in the Lyranian streets; the Grand Fleet’s capture of Klovia; and the two fleets final duke-out in Klovian space. Remarkably, all these battles are very different in character — both in terms of weapons, tactics and pacing — not just from each other, but from all the many battles that had preceded them in Books 1 – 4. This volume, besides boasting those terrific sequences, also dishes out some other thrilling scenes, such as Kim’s saber duel with his immediate Thrallian superior; the scene in which the Dauntless becomes trapped in the limbo of hyperspace (a scene that furthers the plot not one bit, except to ratchet up that elusive sense of cosmic wonder); Kim’s mental battle with Fossten, the ricocheting mental detritus of which is severe enough to kill over 1,500 Boskonians nearby; and, most especially, the reemergence of the Eddorians, in the person of Gharlane, who had played such a huge role in Book 1, Triplanetary, and who’d been absent since the beginning of Book 2. His/its reappearance is surely this installment’s finest moment, and I would not dream of divulging which of the characters Gharlane had been posing as. Kim here has no knowledge of the Eddorians, of course, but thanks to Smith’s wise decision to have written Books 1 and 2 as prequels, the reader surely does, and it is a stunning moment, indeed. 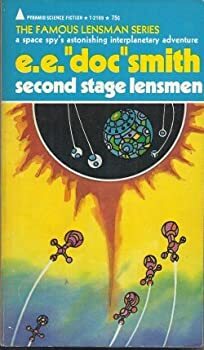 Second Stage Lensman, more so than its predecessors, stresses the chesslike nature of the galactic struggle between the Boskonians and Civilization; both sides, happily, contain beings of genius, cunning and insight. And if I have not made it clear before, perhaps I should say here that the action in these books is not confined merely to the physical. Many of the alien races dealt with are telepathic, as are the Lensmen, natch; thought shields are fairly ubiquitous, thus; and mind control, brainwashing, cerebral wiping and other nasty stunts are commonplace elements of the game. These are fairly sophisticated books, and assuredly meant not just for very bright teens, but for adults, as well. And really, how many teens — or, for that matter, adults — would know the meanings of such words as “peradventure,” “refulgent,” “contumacious,” “gudgeon” and “immiscible,” all to be found in the pages herein? And for the young readers and adults alike, Smith gives us this line, as he compares the evil Boskonians to we members of civilized society: “…it has been argued that sexual equality is the most important criterion of that which we know as Civilization…” A pretty right-on sentiment, wouldn’t you say? Published in 1953. Kim Kinnison was Number One of his time. To him fell the incredible assignment of infiltrating the inner circle of Boskone. Kinnison’s deadly job was to become a loyal Boskonion in every gesture, thought, and deed. He had to work himself up through the ranks of an enemy alien organization, into the highest echelons of power – until it was he who would be issuing the orders that would destroy his own civilization! Masters of the Vortex slots neatly into that 20yr gap between Second Stage Lensman and Children of the Lens, and should be read next in sequence. And though it has nothing to do with the main Lensman storyline, it shows that other important things were going on while the machinery was gearing up for the final battles in defense of Civilization. Thanks, guys. I DO hope to read this final, kinda-sorta-related side story at some future date….